Formed by three Hong Kong-based photographers, Fotoman Camera have set out with the aim of producing hard-wearing large format film cameras for the professional and high-end amateur market that retail at large discounts to their peers. They seem to have struck on a winning idea - produce small manufacturing runs of niche-market formats (a 6x24 model is due as I write) that lack the bells and whistles of their more illustrious counterparts, but make up for these 'deficiencies' by nailing down the price. Indeed, a number of photographers I have spoken to are surprised that they can produce them so cheaply. But are they any good? 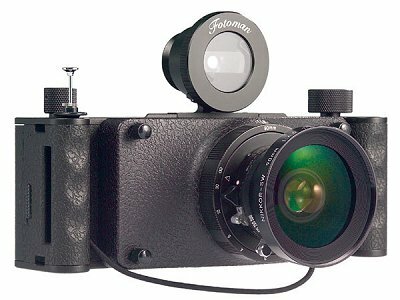 Fotoman, of course, have come onto my radar because of their 617 model and this is a review solely of that camera. The lens supplied was a 90mm Caltar, and it was supplied complete with lens cone and focussing ring. Perhaps they were aware of the impending demise of Fuji's Gx617 system, as this system could step into it's cousins shoes, or perhaps it was just fortunate timing! The first thing you'll notice about the camera is the build quality. Tooled from a solid block of aluminium, you'll be tempted to use it to tap home any protruding nails in your floorboards, indeed it would do the job well without sustaining much damage. The camera back fits snugly into the body with a satisfying click, and the pressure plate and winding reels look as sturdy as the rest of the body. On top is a detachable spirit level (essential for 617 work) and the cleverly engineered viewfinder which is adjustable for a number of lengths of lens between 90 and 180mm. The viewfinder is detachable, which I found most helpful - walking around like a cross between David Bailey and Inspector Clueso, composing through the eyepiece. I wouldn't advise carrying the camera with the viewfinder attached however, the holding clip in its shoe is not especially secure. Composing is perhaps a little trickier than a Fuji - my viewfinder seemed to angle downwards a little, meaning that I began by composing images slightly too high. This problem was overcome without too much practice by finding a suitable visual marker on the lens for the bottom of the image. There's also a reasonably priced ground glass available (I'll be testing that out later) and with the full manual winding, films could comfortably be removed after each shot to recompose if you so wished. Loading can be rather slow, the reels on my model were somewhat stiff, though again nothing that practice couldn't make perfect. There's a reason for stiff reels, however - when tightened they will ensure your emulsion is as flat as can be on the film plane - always a consideration when using a format of this size. Don't be worried about doing this - 120 film is pretty strong stuff. The camera winds backwards (from right to left) which caused me no end of confusion when I first used it. I guess it's something to do with coming from Hong Kong, and I must be tolerant of cultural differences! There's no winding crank, double-exposure protection or automatic film counter - winding is done the old-fashioned way by turning the reels. Film positioning is by red glass window, ruling out the use of 220 film (not that I'd recommend it anyway) and means that a pen torch is necessary if changing rolls in low light. While I was only supplied with the one lens kit (I'll be testing out a 180mm setup soon) the real pull of the Fotoman is its adaptability. A quick look at Robert White's site will show what a wide variety of lenses are compatible with this camera. This will appeal greatly to the large format user who wants a cheap route to 617 work, as they may already have suitable lenses. For the uninitiated though, it's not quite as easy as it sounds - it's preferable that you have a complete cone assembly for each lens you use - this will allow a reasonable swift lens change in the field. For someone starting from scratch I'd recommend beginning with a single lens, say 90 or 105mm and maybe later adding a 180mm when you are more confident. With using large format lenses, you need to keep your fingers well away from that preview switch of course, unless composing with the ground glass. A number of photographers have asked me 'how does it shoot'? Well I would answer- as well as you want it to. As I mentioned, I was using it with a 90mm Caltar lens (a rebranded Rodenstock Grandagon N and by no means expensive) and it produced impressive results; as sharp as my Fuji. The system is compatible with other Rodenstock, Schneider, Fuji and Nikon lenses if you wanted to push the boat out further. You will need to invest in a good quality centre filter however, so factor that into your price; you really can't do without one in this format. All told, this is an impressive piece of kit for the price and should keep you entertained for years. Declaration: This is an independent review and I am not affiliated to Fotoman Camera other than the loan of their camera. They have also asked me to provide a few images for promotional purposes. If you are considering purchasing a panoramic film camera, I'd probably recommend using Robert White for their expertise and the fact that they stock a range of manufacturers. They will be able to advise what is best for your needs and price range.